A textiles lecturer at the University of Southampton’s Winchester School of Art has been chosen to show her work at the world class Jerwood Contemporary Makers Exhibition 2009. 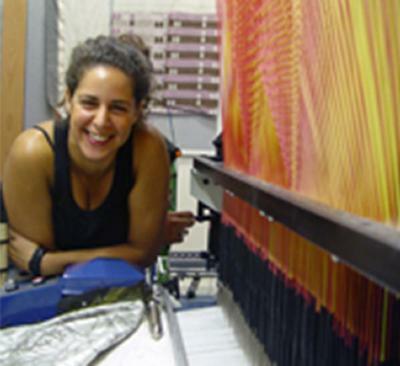 Ismini Samanidou is a textile designer and artist who works with woven cloth. “I am thrilled to have been selected and hopefully I can pass on some of the experience to my students at Winchester School of Art,” commented Ismini. Ismini’s finished piece will be a three metre high walk through installation inspired by the history of the Jerwood Space, where the exhibition is taking place. Her work is mainly woven on a computerised jacquard loom and the piece is so large she has been granted rare access to use a special industrial sized giant loom at the Oriole Mill, North Carolina in the USA. The Jerwood Contemporary Makers exhibition opens on 10 June at the Jerwood Space, 171 Union Street, London and runs until 19 July. It will then tour the UK.